Despite his endeavors to create a more inclusive environment within the walls of Twitter’s headquarters, on the internet, Twitter’s behavior is markedly different. Political officials and media outlets have accused Twitter of favoring Democrats and liberals over Republicans and conservatives — a behavior that is being greatly contested in Congress and in the media. While Dorsey has admitted that there is a “left-leaning bias” among Twitter employees, he maintains that this bias does not translate to the actual algorithm Twitter uses to return search queries. Nonetheless, this accusation of political bias, whether intentional or unintentional, has resulted in Twitter, Facebook and Google testifying before the Senate Intelligence Committee, speaking particularly in regard to the alleged influence foreign powers may have in their use of social media platforms and search engines. Calling these media platforms into question, however, is not exclusive to American politicians. For instance, in May of 2018, Mark Zuckerberg, CEO of Facebook, appeared at a European Parliament hearing where he was questioned extensively on Facebook’s various data scandals and practices. At this hearing, the representative from the United Kingdom, Nigel Farage, questioned Zuckerberg on Facebook’s practices towards conservatives, accusing him of censoring conservative voices on the platform. Despite all these platforms denying these claims of political bias, the impact of their testimony and their practices being called into question by a legislative body greatly harmed consumer confidence in these companies. Just one day following their testimony in the U.S. Senate, Twitter’s stock dropped by 5.7 percent and Facebook’s stocked dropped by 3.2 percent. While Google refused to testify before the Senate, Evercore ISI analyst Anthony DiClemente argued that Google’s choice not to be present “‘may prove to be a misstep’ as members of Congress seemed annoyed by the absence” and still resulted in Alphabet, Google’s parent company, dropping 2.2 percent in the stock market. Furthermore, the government’s increased scrutiny of social media and internet-based platforms has impacted corporations not even involved in this Washington fiasco, possibly as a result of the fact that consumers still associate social media platforms such as Snapchat with platforms such as Twitter and Facebook. For instance, though Snap Inc., the parent company of Snapchat, “isn’t generally subject to the fake-news and election-interference scrutiny” as greatly as “its larger peers,” its stocks are still down and Snap is “trading in single-digit territory for the first time” following Twitter’s and Facebook’s testimony on the Hill. The consumer reactions to allegations of bias, fake news and foreign meddling on Twitter and Facebook are indicative of the power Congress has and the importance consumers place on trustworthiness when it comes to using these platforms. But the question remains, do these allegations have merit? The answer depends on who is asked. A recent open letter from the Republican National Committee alleges that Twitter and Facebook “operate in liberal corporate cultures” and as a result, not only return biased search returns but also actively delete conservative users from the platform. Yet, all accused parties stand by the claim that they have done nothing wrong. Furthermore, in a recent study conducted by Harvard University, it was found that Google’s search results do have a bias towards Democrats. 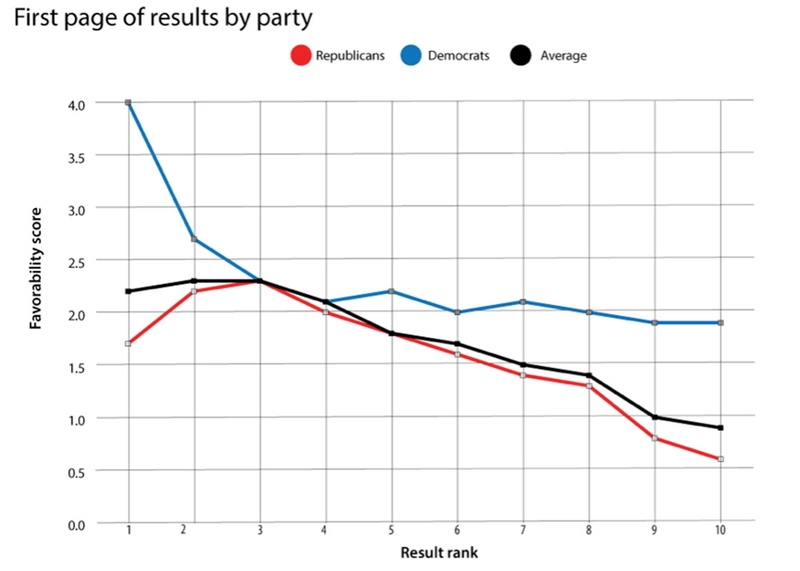 As shown in the chart above, there is a clear discrepancy between returns on Republicans versus Democrats, where Democrats appear with greater favorability in the first few search responses and continue to hold greater favorability than Republicans even in later search returns. Regardless of culpability, it is the obligation of these corporations, when called before the Senate or House, to testify before them in order to ensure fairness and to mitigate any bias or discrimination on the part of these companies against a particular group or party. Anastasia Pyrinis is a writer for the U.S. Section of the BPR, studying Political Science and Economics with a minor in Public Policy. When she is not reading about the latest political news or writing about it, Anastasia enjoys debating international and domestic issues, especially competitively as part of Model United Nations. In her spare time, she enjoys traveling and watching classical movies, particularly film noirs. Previous ArticleTurkey: Where Do We Go From Here?